THE year 2018 appears to be a period where housing developers in Kuala Lumpur adopted a more cautious approach in launching new projects. Based on the data compiled by us, we noted that there was a significant dip in the number of new projects launched in the first nine months of last year compared to the same period the year before. Our records showed that there was a total of 36 new projects launched in the first nine months of 2017, but for last year, there was a drastic decline of about 42 per cent to just 21 new projects. In terms of number of units, the drop was even more pronounced. Our records showed that there were 27,693 units launched in the first nine months of 2017, but the number declined to a mere 10,745 units in the same period last year, a drop of about 61 per cent. 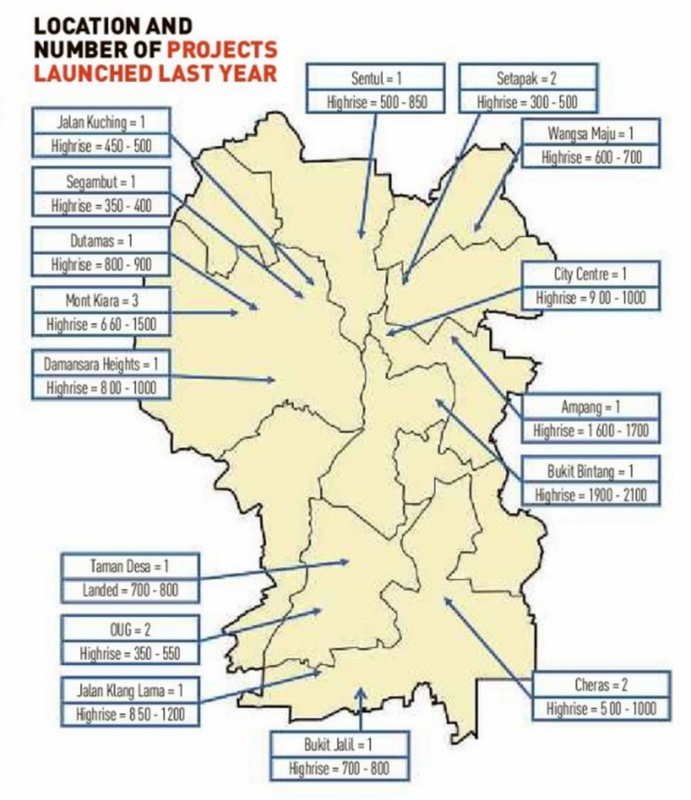 The drop in the number of new launches is, however, not unexpected as there were a lot of uncertainties in the first half of the year leading to and immediately after the 14th General Election (GE14) and developers preferred to err on the side of caution. Furthermore, the market sentiments were weak and developers were still trying to clear the unsold stock carried forward from projects launched in the previous years. New projects launched in land-scarce Kuala Lumpur are typically strata residential properties with condominiums and service apartments forming the bulk of the units launched. For first quarter (Q1) to third quarter (Q3) of 2017, our data reveals that all the 36 projects launched were strata properties. The same pattern was observed last year although interestingly there was one terrace house project launched during that period. In terms of residential types, condominiums and serviced apartments, not surprisingly feature prominently for developers for both in 2017 and last year. In 2017, 38 per cent and 44 per cent of the projects were of condominiums and serviced apartments respectively while last year, a similar trend was observed as 33 per cent of the new projects were condominiums and about 43 per cent were serviced apartments. However, there were no SoHo/SoFo/SoVo/Solo projects launched last year, as opposed to two projects launched in the previous year. The first three months of 2017 revealed a pattern of a gradual monthly increase in terms of number of new launches. However, last year the number of new project launches declined from January to February, and then spiking back in March, making it the most active month with six project launches. Nevertheless, this was short-lived as developers took a step back for the next two months as the number of launches plunged in April and May, possibly due to the general lack of interest to make substantial financial commitments prior to GE14. Developers came back to the market with five new launches in June to latch onto the feel-good factor after the election which unexpectedly resulted in a change of government. The pace of new launches, however, was not sustained and slowed down through July and August. September was the month with the most number of new projects launched in 2017 whereas in 2018, the honour went to the month of March. Zooming in on the size of the units launched, we noted that in 2017, most of the units launched have built-up areas of between 800 and 1,000 sq ft (24 units) and between 1,001 and 1,200 sq ft (20 units). Housing developers maintained this formula last year as the units launched during this period were also within this range of built-up areas. These sizes are quite standard for up-and-coming condominium and service residence projects as they are aimed at smaller families or even as an investment piece given the projects’ locations being within the city centre. In terms of pricing, our data revealed that approximately 42 per cent of the new projects launched in the first nine months of 2017 offered units priced at RM600,000 and below whereas the figure dipped to only 28 per cent last year. 20 per cent of the projects were available within the RM800,000 to RM1 million and RM1 million above brackets, respectively. We also noted that a higher number of projects launched last year were at higher price points of RM1 million and above (31 per cent last year versus 20 per cent in 2017). At the same time, 19 per cent of the projects had units within the RM800,000 to RM1 million price bracket and 22 per cent within the RM600,000 to RM800,000 bracket. This comes as a surprise as the market sentiments were generally still weak last year. Nevertheless, it has to be remembered that land available in Kuala Lumpur for development are scarce and more expensive and as such, the prices of the houses launched had to commensurate with the higher land cost. For Q1 to Q3 2018, there were 10 projects (36 per cent) offering units priced at RM751 to RM1,000 per sq ft, followed by eight projects (28 per cent) offering units priced at RM501 to RM750 per sq ft. This differs from the previous year, as there were then 15 projects (34 per cent) which offered units at a more reasonable bracket of RM501 to RM700 per sq ft, and 12 projects (27 per cent) with prices below RM500 per sq ft.
Location-wise, the former mining township of Kepong appeared to be developers’ area of focus in 2017, with seven brand new projects in the area, followed by Bukit Jalil with three projects. 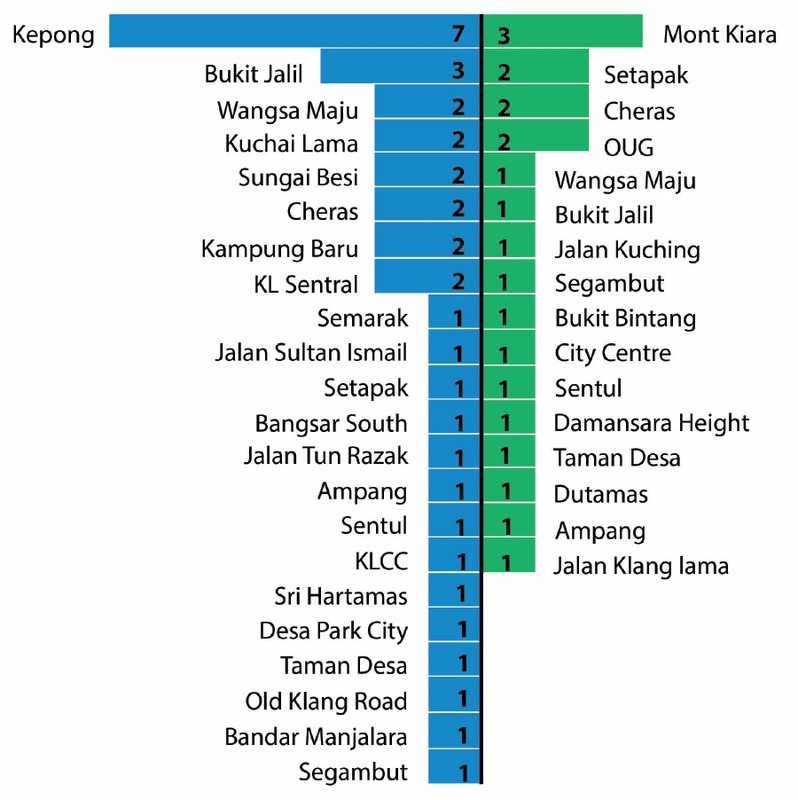 Last year, the interest seems to have shifted to Mont Kiara with three projects, followed closely by Setapak, Cheras and OUG with two projects each.